Of all the plaques located on the memorial wall to dedciated to acts of Heroic Self Sacrifice, in Postman's Park, the one that attracts most comment is that to John Cranmer Cambridge (1877 - 1901). 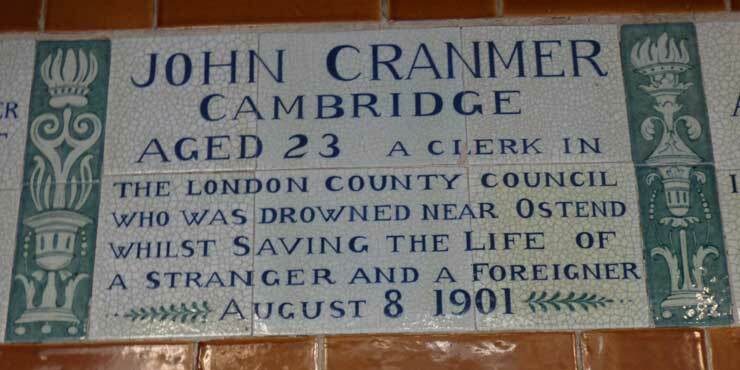 It reads, "John Cranmer Cambridge, Aged 23, A Clerk In The London County Council, Who Was Drowned Near Ostend, Whilst Saving The Life Of A Stranger And A Foreigner, August 8 1901." Despite the jingoistic overtones of his plaque, John Cranmer Cambridge most certainly earned his place amongst the everyday heroes when he gave up his life in endeavouring to save the life of a fellow human being - irrespective of their nationality. "Yesterday morning four English visitors to Ostend, two of whom were ladies, were carried away by the current while bathing on the West front. Three of them were saved by a lifeboat - but the other, a man named John Cambridge, was drowned. His body was washed up on East Beach some time after the accident." As it transpired, the earliest reports on the tragedy were wrong. John Cranmer Cambridge had actually been enjoying a break at Ostend with his siblings Frederick Royston Cambridge, Lucy Dorothea Cambridge, and Violet Marjorie Camrbridge. The 8th of August 1901 and been a fine sunny day, and the party had made their way early to Ostend's West Front, in order to ensure they could take full advnatage of what promised to be a fine summer's day. "Mr. John Cambridge, who was drowned at Ostend on Thursday, was the son of Mr. Frederick Cambridge, for many years organist of the parish church, Croydon. He was only 24 years of age, and was a clerk in the employ of the London County Council. He left Croydon an Tuesday, with his brother and sister, the latter of whom saw the fatality from a short distance. Mr. Cambridge swam out to the assistance of a young lady who was in difficulty in a strong current. He managed to keep her afloat for a time, and she was ultimately rescued, but Mr. Cambridge sank." Evidently, the early accounts of what had happened carried mistakes, and, as a consequence, John Cambridge's Brother, Frederick, felt it necessary to write to the papers to correct what he felt were misleading reports about his sibling's fate. The account he gave of the tragedy is astonishing in that, if his atatement is to be believed, the rescuers had, effectively, abandoned John to his fate. "Mr. F. Royston Cambridge, of Croydon, brother of Mr John Cambridge, who was drowned at 0stend on Thursday, writes that the telegram relating the episode gives a misleading account. "My brother, who was a very good swimmer, saw, while bathing, an unknown person drowning, and swam out to her assistance. The bathing boat rescued the lady, and one other bather, but the boatmen declined to go out again, although we implored them to do so, and offerred them payment, until they were ordered out by the officials. It was then, of course, too late."" John Cranmer Cambridge was buried in the churchyard of the English Church, Ostend. And, as for his act of heroic self sacrifice - well, he certainly did save the life of a stranger; but whether she was, in fact, as the plaque states, "a foreigner" might be open to debate. Exit St Paul's Underground Station via Exit One, for Aldersgate Street. Head along St Martin's Le Grand, passing Maplin and Tesco Express. Cross the main road via the traffic light pedestrian crossing, which is located a little way along. Veer right on its other side and, just after the blue police box on the left, head left through the gates of Postman's Park. Cross to the tile-roofed porch that you can see opposite. This is the "Memorial To Heroic Self Saccrifice." 8am to 7pm, or dusk, whichever is earliest.